Eat Me Magazine Issue 4 with features on Heston Blumenthal, the beloved Bread and Butter pudding, a chewing gum recipe by Bompas and Parr, London Food Guide, interesting pull out recipe postcards (these are very lovely!) and food sampling in Melbourne. This is a (newish) funky publication all about food (my fav topic!). The magazine is pretty good as well with beautiful and well thought out page layouts, excellent use of uncoated paper stock too (which creates a nice soft finish and tactile quality not possible with most coated papers). 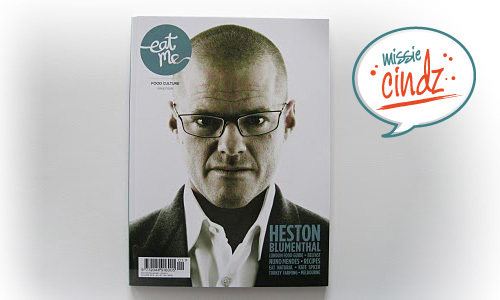 This months cover is Heston, (the top chef is famous for his quirky dishes and three-Michelin-starred Fat Duck restaurant), and has some really good articles if food is a passion for you.Â I hope to ‘one day’ create illustrations for one (or two) of their spreads. What do you think Eat Me Editor?